Many iPad Pro owners have vented their frustrations at Apple for the fact that the otherwise wonderful Smart Keyboard for the device doesn’t have any place to store or secure the Apple Pencil. Twelve South – an extremely well-known and respected accessory company – has stepped up to the plate to launch an Apple Pencil holder which integrates with the existing Smart Keyboard. Apple took a bit of the criticism on board and actually released a couple of accessories which take Apple Pencil into consideration. One of those is dedicated Apple Pencil Case, and the other is a Leather Sleeve which contains a home at the top for the Pencil to slide into. Both do their job very well but neither actually address the frustrations vented by those who rely on the Smart Keyboard. Twelve South’s solution – called the PencilSnap – not only houses Apple Pencil like iPad Pro owners want but also snaps directly onto the existing Smart Keyboard to create what appears to be one unified accessory. The first thing that you will notice is that PencilSnap isn’t a million miles away from Apple’s own Pencil Case accessory in terms of visuals and overall aesthetic design. 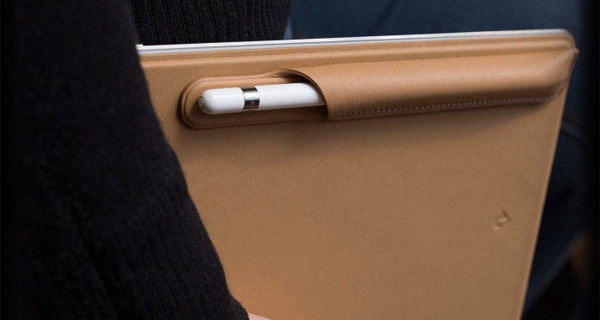 The small leather pocket holds the Apple Pencil snugly and securely, just like Apple’s Pencil Case, but it comes with built-in magnets which allow an owner to easily attach it to other accessories and surfaces with a magnetic surface. And yes, you guessed it, that includes the Apple Smart Keyboard, as well as a variety of other accessories. One of the immediately impressive things about the new accessory is that Twelve South is literally putting its reputation on not only how well the accessory holds the Apple Pencil in place but also how strong the included magnets are which are tasked with keeping the accessory securely in place, regardless of how the owner decides to attach it. When we are dealing with a stylus as cutting-edge and expensive as Apple Pencil then it’s imperative that it’s securely stored at all times when inside of the accessory. Twelve South is selling the PencilSnap accessory for $29.99 in either a Black or Camel finish. It’s available to purchase right now.